Writer, scholar, crier, author of "Sistering," "Love Letters of the Angels of Death," and "The Apocalypse of Morgan Turner"
Maybe you don’t feel like reading a book right now. I understand completely. Fortunately, reading isn’t the only way to experience a story, especially if it’s full of music and pictures. And so we bring you a bit of a playlist from my newly released novel, The Apocalypse of Morgan Turner. The book’s protagonist is looking for meaning, and art is one of the places she looks first. Not at all an elite high-culture consumer, art for Morgan Turner is the movies, TV, music other people have cued up, and books from the stacks at the public library. Much of it, she doesn’t even like (and, though it doesn’t matter, I don’t like all of it either). But here is a little of what she is watching and hearing. Morgan also watches The Seventh Seal/ Det sjunde inseglet. The first scene, where the Crusader knight returning to Europe plays chess with Death on a rocky beach, is probably what this film is best known for, but don’t miss the final chess scene, in the forest. The television Morgan ends up watching is much brighter than the films she sees. You’re welcome. It’s Morgan’s coworkers who introduce her to South Korean romantic comedies. Here is one she loves: Secret Garden, where risqué action like this is a big deal. Many thanks to the cab driver in northern China who had this song playing on repeat one sweltering Saturday morning. This book has books in it, from the Criminal Code of Canada to the Bible to The Dungeons and Dragons Player’s Handbook itself. The book that figures most prominently is probably a graphic novel version of Inferno from Dante’s Divine Comedy/Divina Commedia. I didn’t have any particular version in mind but I did imagine it illustrated with Gustave Doré’s definitive wood cuttings. 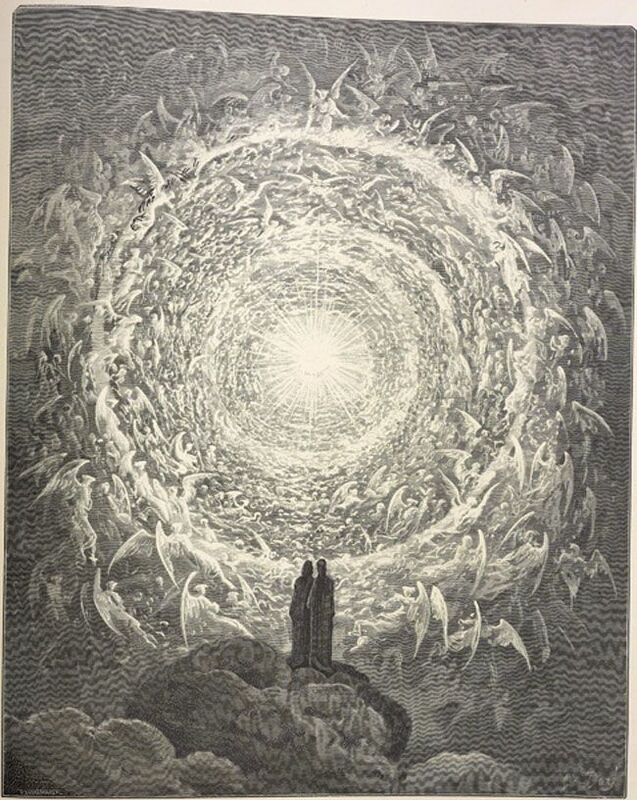 Here is one of my favourite pieces from the Paradise book of the Divine Comedy, the Celestial Rose. I think it’s probably Morgan Turner’s favourite too.